Don’t be fooled, this is not an easy trail. 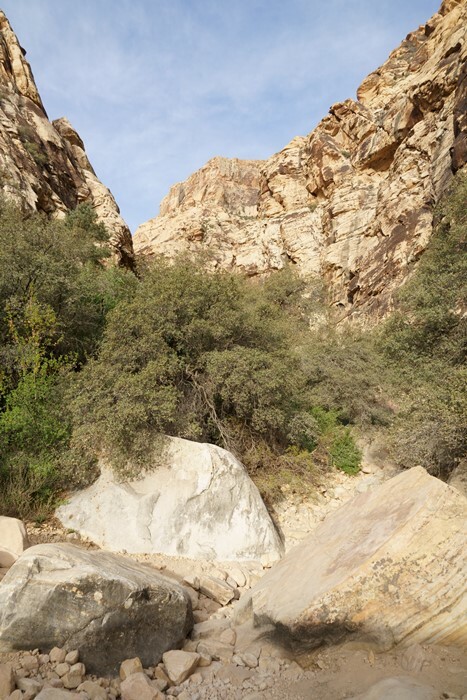 Sure, it looks short and sweet on the map, but Ice Box Canyon provides a solid workout. And to reach the very best views near the end, you have to attempt some risky rock-climbing maneuvers. But, for all that effort, the rewards are as big as the boulders standing in your way. 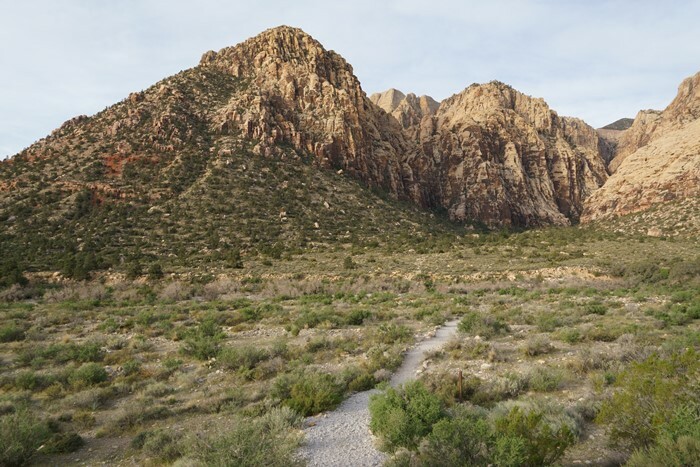 Red Rock Canyon is located on the west side of Las Vegas. From the south end of the Strip, take the Highway 215 beltway clockwise (west, then north) to the Summerlin area. Take exit 26 (you’ll see the big Red Rock Casino on the right). Turn left, away from the casino, and follow Highway 159 (Blue Diamond Road) 5 miles to the scenic drive entrance. 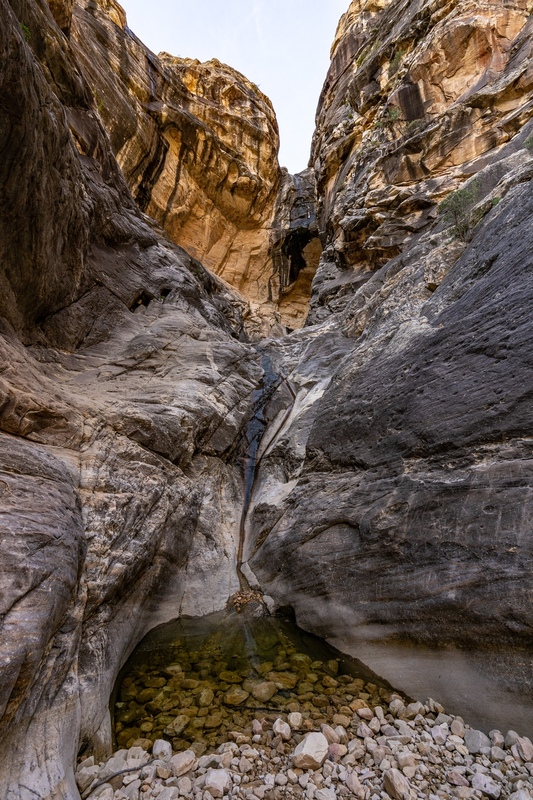 The Ice Box Canyon trailhead is located around mile marker 8 on the scenic drive. From the parking lot, the view of what’s ahead is misleading. 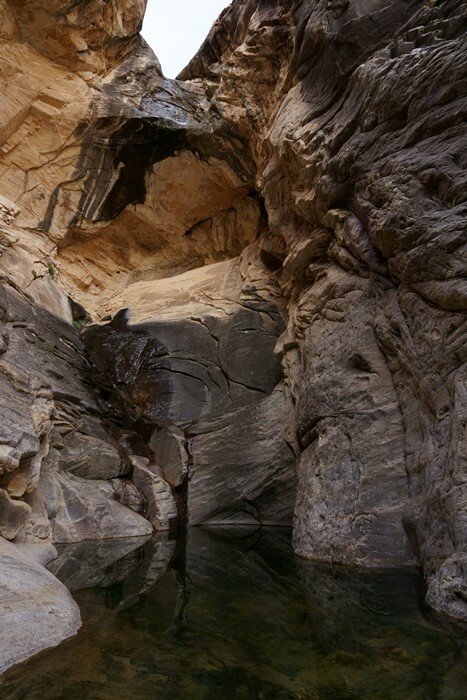 It’s about 1.3 miles from the trailhead to the end of the trail, deep inside Ice Box Canyon. From here, it looks easy, and I couldn’t figure out why the park guide called this a strenuous trail. I figured it out, soon enough. 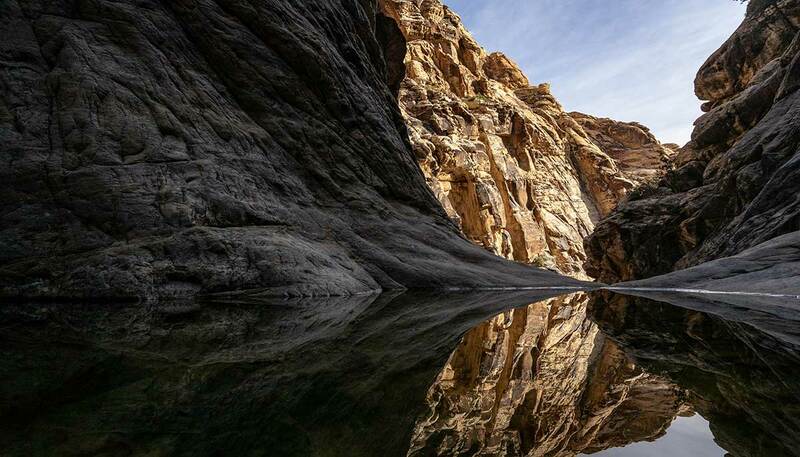 The trail is easy at first, but as soon as you reach the mouth of the canyon, the fun begins. 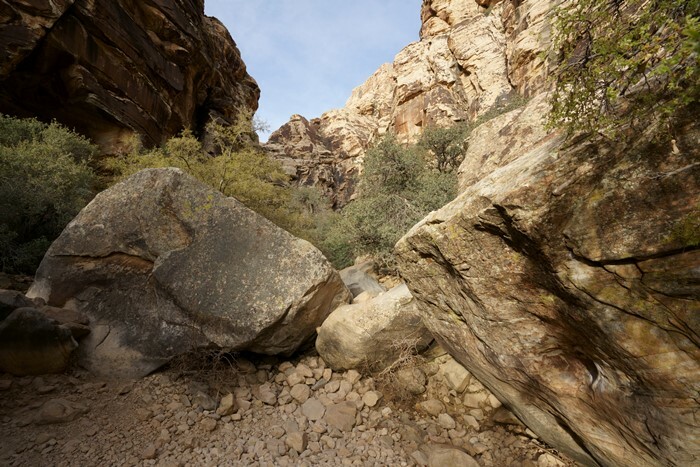 I’d argue that there really isn’t much of a trail here – just a dry wash filled with gigantic boulders. It’s a challenge to find your way. Sometimes the trail goes around the big boulders, other times it simply goes up and over them. And you’ll probably have to try a few routes, and reach several dead-ends, as you make your way up the canyon. … but it’s pretty easy to climb up to the second pool. Here, you’ll find a great mirror-like reflection in the water. It’s enough to make you want to go even further. And you can, but this is where it gets sketchy. The only way up to the third pool is right here, on this steep slope next to the trickling waterfall. You’ll have two options — on the left, there’s a groove in the rock that looks somewhat like a playground slide. It’s farther from the waterfall, but it’s also steeper. The less steep option is in the middle of the photo. It’s more manageable, but the margin of error is much narrower. If you lose your balance, you’re going to tumble down the cliff and splash into the pool of water below. I managed to get up to the next pool without much trouble. Getting down would be a different story. The third pool is as far as most people will go. At this point, you really have reached the end of the canyon. But, it’s obvious that some people have gone further, based on the graffiti that can be seen further up the canyon walls. From this third level, the view up and down the canyon is quite beautiful. But, unless you’re really confident in your rock-climbing skills, you probably shouldn’t come up here. I enjoyed the views for a while at this upper level, then started figuring out how to get down. It’s definitely much easier to climb up that slope than go down it. Making it more challenging, I had brought a camera bag, filled with expensive equipment, and a tripod up there with me. I didn’t want it to end up in the water, about as much as I didn’t want to fall down the cliff. I tried several approaches, facing forward and backward, with my camera bag in front of me, beside me, and behind me. I’m not exactly sure how, but I did get down safely. 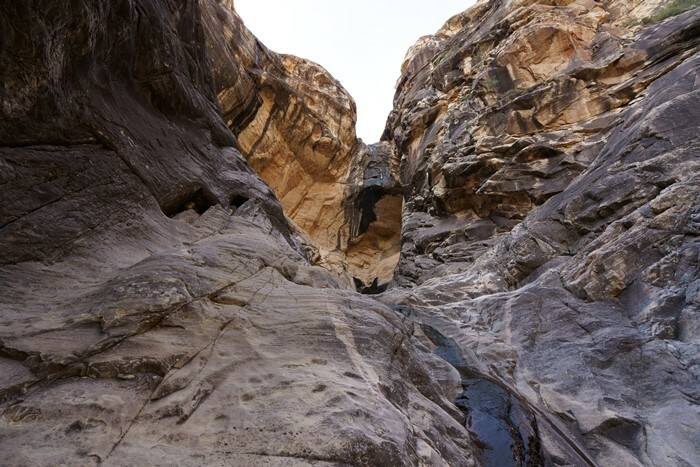 A Google search of “ICE BOX CANYON INJURED” returns multiple stories about people getting hurt on this hike – although they are not specific as to whether the accidents took place at the falls. The park could very easily make this part of the hike much safer by installing a cable or a few metal hand-holds here, or simply chisel some steps into the rock. None of this would detract from the beauty of the falls, and would certainly make the second and third pools much more accessible. 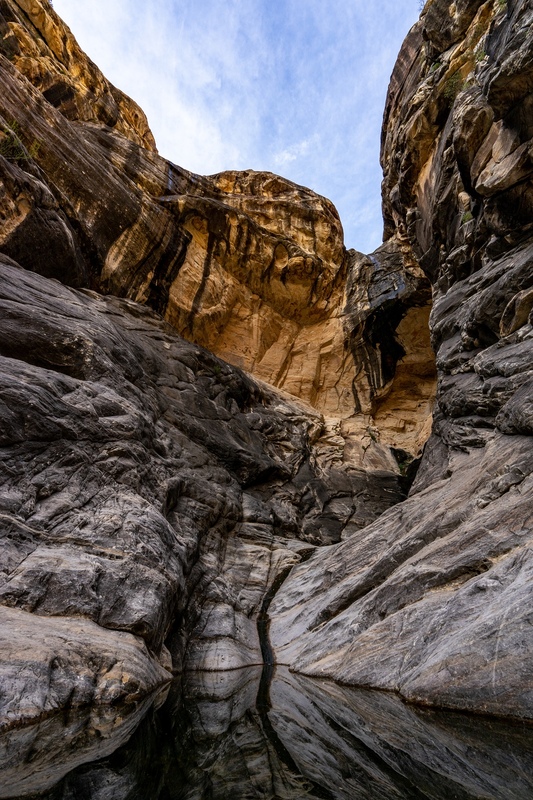 Don’t underestimate the effort required to hike Ice Box Canyon. It’s a short trail, but a big workout, due to constant rock-hopping and boulder-scrambling. You should probably go no further than the second pool, unless you’re comfortable with your rock-climbing skills. All the effort is worth it, though, for the beautiful views and mirror-like ponds at the end.